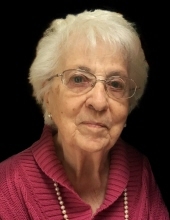 Evelyn Mae (Burton) Roberts, 98 of Quincy, MA passed away peacefully on March 23, 2019 in West Bridgewater surrounded by her loving family. Evelyn was born in Tyngsborough to Harry Edward and Doris Estelle (Luke) Burton on October 12, 1920. She graduated from Chelmsford High School in 1938. She married Rev. Warren M. Roberts on October 1, 1949. Evelyn was a wonderful cook and baker and shared her talents with many through the years. She helped her husband Warren with his duties as a Methodist minister and worked at Fernandes Supermarket and Coldata Collection later in life. Evelyn is survived by her son Warren Yeo and his wife Colette of West Bridgewater, her grandchildren James, David and Emily and her great granddaughter Riley all of West Bridgewater. She is survived by three sisters, Thelma Vance and her husband Richard of Pepperell, Lorna Ahem of Lowell and Sylvia Pokraka of West Warwick, R.I. she is also survived by many cherished nieces and nephews. Evelyn is predeceased by her husband Warren, her brother Vernon Burton and her sisters Phillis (Burton) Lovett and Claire (Burton) Dunning. All are welcome to a memorial service being held on Friday April 5th at 11AM at the Church Hill United Methodist Church, 11 Church St Norwell, MA. In lieu of flowers please make donations to Old Colony Hospice 321 Manley St. West Bridgewater, MA 02379. "Email Address" would like to share the life celebration of Evelyn M. (Burton) Roberts. Click on the "link" to go to share a favorite memory or leave a condolence message for the family.